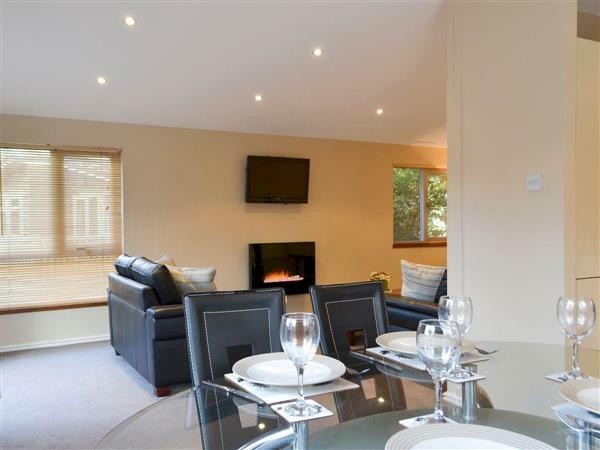 Brotherswater Lodge in Windermere, Cumbria sleeps 4 people. Brotherswater Lodge in Windermere is close to the shore of Lake Windermere, on the popular White Cross Bay Holiday Park; Brotherswater Lodge is ideally placed for families and friends to enjoy this popular park with quite literally something for everyone. A well-presented lodge, with the added bonus of a private hot tub to enjoy on the decking area, guests will find everything for the perfect break close at hand. Stroll down to the lake to the designated picnic area, jetty and marina, and admire the breathtaking views over the lake to the fells beyond. Whatever the season, the views are picture perfect. The park offers excellent on-site facilities, including an indoor heated swimming pool, sauna, Jacuzzi and gym (leisure pass at an extra cost, payable on arrival), along with a sports area, shop, pub and restaurant. For guests looking to explore this beautiful area, the location is a great base, with easy access to the ever popular Lakeland villages of Bowness and Windermere, and many walking routes from your doorstep. From Bowness, steamers cruise the length of the lake, offering a relaxing way to enjoy the views. The World of Beatrix Potter Attraction and a mix of pretty shops, cafés and restaurants, ensures there is something for everyone. Heading north, it is just a short drive to Ambleside, with its Lakeland charm and array of facilities to enjoy, whilst closer to home is the pretty village of Troutbeck. Drive along the Kirkstone Pass and admire the breathtaking views while descending down to Lake Ullswater. The beach is 18 miles from Brotherswater Lodge in Windermere. With the shop, pub and restaurant 100 yards from Brotherswater Lodge. Ground Floor: 5 steps to entrance. Brotherswater Lodge in Windermere is all on the ground floor. Gas central heating, gas, electricity, bed linen, towels and Wi-Fi included. Enclosed decking with garden furniture. Hot tub (private). Indoor heated swimming pool (shared with other properties on-site, extra charge, payable on arrival) with Jacuzzi, sauna, steam room, gym and shower and changing facilities. Private parking for 1 car. No smoking. Please note: There is an unfenced lake in the grounds, 50 yards away. Holidays at Brotherswater Lodge run from Friday to Friday. For a better idea of where Brotherswater Lodge is, you can see Brotherswater Lodge on the map below. Brotherswater Lodge is in Cumbria; should you be on the lookout for a special offer, you can find all the special offers in Cumbria. It's always worth checking to see what is on offer at the moment. Do you want to holiday near Brotherswater Lodge (UK1209), you can see other cottages within 25 miles of Brotherswater Lodge; have a look to find your perfect holiday location.